I made spaetzle this weekend. I have been wanting to make this for years and decided it would be a nice side dish with our grilled salmon. I searched around and found several recipes which all differed slightly. I got caught up in the Smitten Kitchen blog reading her post and the 400+ comments regarding her spaetzle. I ended up using a recipe from this blog. I really like her uncomplicated approach. It was just what I needed when I was feeling a little intimidated by the numerous other recipes. Some things need not be complicated. Spaetzle is one of them. I used brown butter and sage to flavor the spaetzle, then at the last minute I added cream. In hindsight the cream was unnecessary. I knew it right when I poured it in the skillet. However, it was out of this world delicious! As comforting as a good homemade mac and cheese. 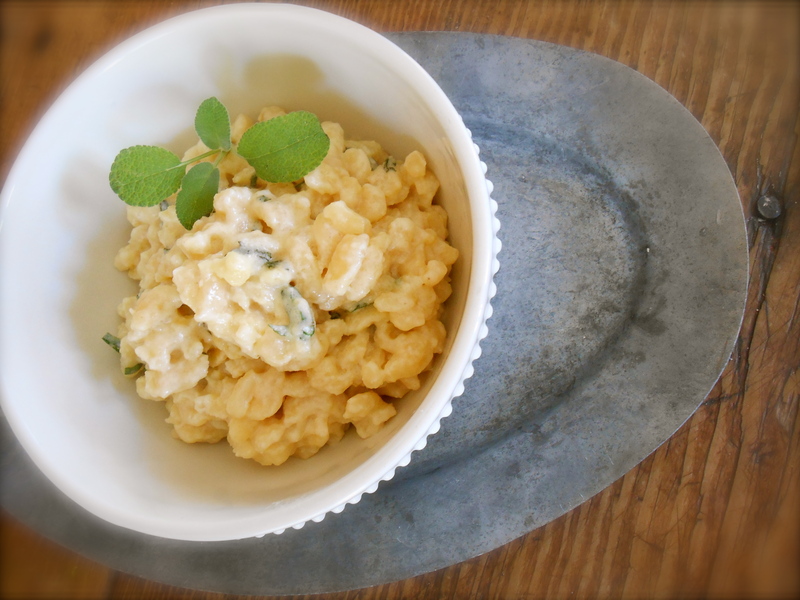 If you are serious about making spaetzle take a look at The Tasty Kitchen blog for a detailed tutorial. Bring a large pot of water to boil and add a bit of salt . Add flour and salt to a large bowl and mix together. Beat the eggs and add them to your flour mixture. Add water and stir well to work out all the lumps. Using your colander and spatula, pour the dough into the colander. Keep the colander above the steam so it doesn’t cook before it gets pushed through the holes. Press the batter through the colander with the spatula. Drops will fall into the water and cook instantly. Boil for 3 to 4 minutes. Remove the spaetzle from the water and strain it into a bowl. Toss with a bit of olive oil to prevent it from sticking together. Heat the butter in a large skillet over medium high heat. Add the sage cook until aromatic. Toss in the spaetzle and brown to your liking. Here is where I added the cream (unnecessary) and allowed to simmer for 5 minutes stirring occasionally. Looks like a great recipe to save. Hi Seana! Spaetzle!! OMG! I’ve been wanting to try making my own spaetzle after eating goulash at a Hungarian restaurant… but never really looked around for a recipe. Now it’s here in my face! thanks so much for sharing! Looks amazing! And have a beautiful week!! I have only had spaetzle at German restaurants. It is wonderful. You’ll love it. I have seen it sold in dry form (like pasta) at the stores, but, I have a feeling making it is much better. Love your enticing description and this also looks SO good. Thank you so much. This really is comfort food. I really had to work hard not to eat thirds! Oh, isn’t spaetzle delicious? Your looks particularly so—with or without the cream. I have always loved dumplings and after making spaetzle I realize how it is actually just little tiny dumplings. So delicious and chewy. Oh, I love spaetzle it’s so easy to make and totally delicious. I will use this recipe, I have never made it before but have it all the time in a German restaurant in my neighborhood! So glad you posted this! Spaetzle is totally new to me. How does it taste like? :) It actually is fun in a satisfying way…. I love the use of the colander to make the spaetzle. And brown butter sage – it just doesn’t get any better than that! YUM!! I totally agree with your idea that recipes need not be complicated!! This looks like something I could really make. Your picture is so inviting. thanks for the inspiration! Thank you Rhonda. I realize more and more how I tend to gravitate toward simplicity when it comes to cooking. Perhaps you’ll make some at one point. Little dumplings! Although I’ve never made spaetzle, I have made enough pasta and served it with sage & brown butter to know how delicious the pairing is. It’s certainly easy enough and, frankly, most of the really tasty recipes are. Thanks for sharing. I imagine spaetzle to be easier than making pasta. Oh why, just why am I so intimidated to make my own pasta! :) I have made gnocchi before. It turned out really well. I agree about easy being tasty. Especially when it comes to sauce. Thank you for commenting! isn’t it a kinda pasta??? Isn’t it so fun to make your own spaetzle? It tastes so good too! I learned how to make it when I lived in Germany, but I’ve never tried it with brown butter sage before… Looks super yummy, I’m putting this om my list! between your conchigli post and this I’m drooling and daydreaming about gobbling up yummy yummy pasta! THIS is one of my favorite side dishes. I even bought a spaetzle maker. I had no idea how to make it and once I set out looking I quickly became intimidated too. Then once I got into it, wasn’t so difficult. Hope you do try it. It’s great. You are currently reading spaetzle with brown butter sage at COTTAGE GROVE HOUSE.